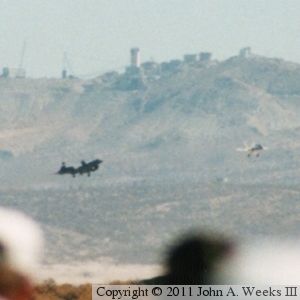 The SR-71 Blackbird in flight, making a pass flying northeast above runway 4L at Edwards Air Force Base on the downwind leg of its landing approach. The thin vapor trail is the Blackbird dumping fuel to reduce its landing weight. The SR-71 Blackbird flight demonstration scheduled for the Edwards Air Force Base open house over the weekend of October 9 and 10 was highly anticipated. Aviation fans from around the world made the trip to Edwards to see a number of exotic and experimental aircraft fly, including the legendary Blackbird. 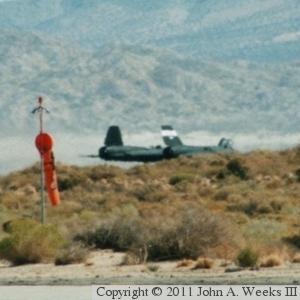 The SR-71 flight, shown here, went off without a hitch on October 9. The flight scheduled for Sunday, October 10, was canceled due to a fuel leak that could not be fixed in time for the open house. NASA flew no additional Blackbird flights, and the USAF never returned the SR-71 to service, so this flight on Saturday, October 9, was the last time a Blackbird would ever fly. Note—these images were scanned from prints of photos that were taken from a vantage point a mile from the runway looking into the bright afternoon sun at an aircraft that is painted black, so they are a bit small and grainy. My first roll of film with the take-off and several flybys was damaged, so I am lucky to have any photos at all from this historic event. 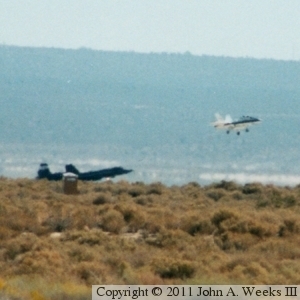 These two photos are the SR-71 on final approach to runway 22L, with a NASA F/A-18 Hornet flying off to the left and slightly ahead of the Blackbird. The SR-71 entered service in January, 1966, and served with the USAF through 1991. 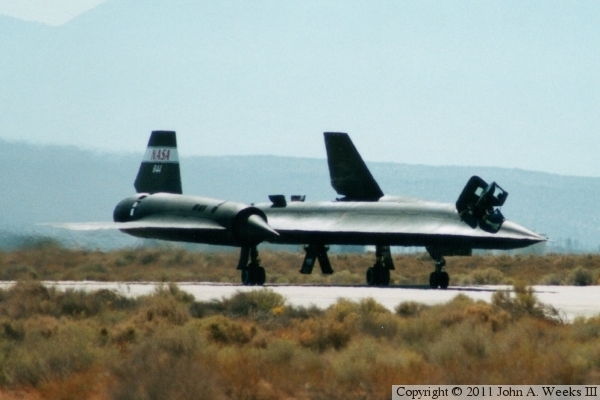 NASA operated 3 Blackbirds through the 1990s. The aircraft measures 99 feet long, 55 feet wide, and the tails are 18 feet tall. The huge engines operated as turbojets at low speed and as ramjets had at higher speeds, with the two engines developing a total of 65,000 pounds of thrust. That could push the Blackbird past Mach 3.3 and to altitudes above 85,000 feet. The aircraft burns JP-7, a blend of kerosene that contains TEB (triethylborane). Over half of the aircraft gross weight is fuel. The photo above and to the left is the Blackbird touching down on the runway for its final time, while the photo above and to the right shows the nose starting to drop down towards the runway. There are several variants of the Blackbird. The earliest was the A-12 reconnaissance aircraft built for the CIA. The program was nicknamed Archangel, and the production aircraft were the 12th design revision, leading to the A-12 designation. The aircraft first flew in April, 1962, and were operated under the code name Oxcart. 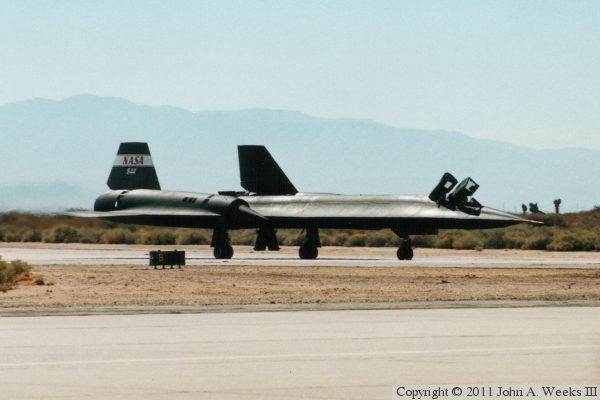 The A-12 was in operation from late 1962 through mid-1968. 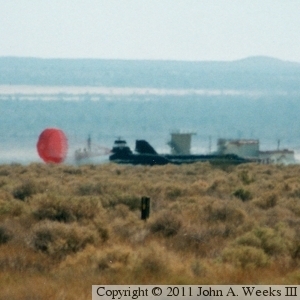 The photo above and to the left shows the SR-71 decelerating with its drag chute deployed. 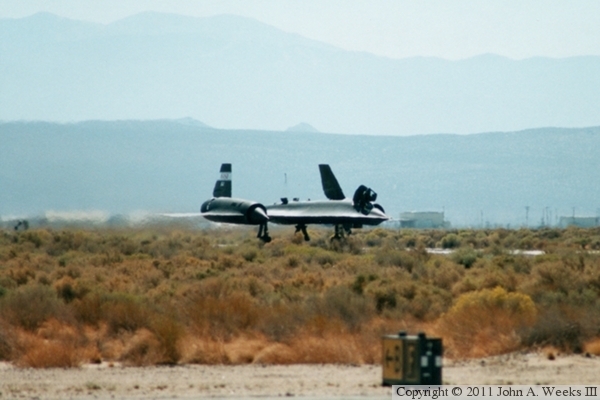 The photo above and to the right is the last time history will see a Blackbird moving under its own power as it slowly marches down the taxiway towards the South Base complex. Other Blackbird variants include the YF-12A fighter, of which three prototypes were built. Since the YF-12A took half a state to turn around, it more likely would have been used as a bomber, but it never went into production. The SR-71 was a two seat recon version. It first flew in late 1964. 32 aircraft were built, of which 20 survive. A final type was the M-21, which operated as a mothership for the D-21 drone. 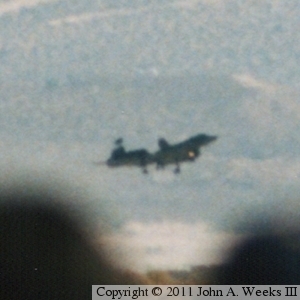 One of the two M-21 aircraft crashed on a mission, leading to the M-21 program being canceled after only 4 missions. After the SR-71 landed, the crew brought the aircraft up to the Main Base ramp area to make one final pass in front the crowd. In the photo above, the aircraft has just turned off of the runway onto the taxiway. Blackbird operations are complex and costly. The aircraft burns a special fuel. It has to be refined in a batch and then delivered where needed with special handling. The aircraft itself generally takes off with a light fuel load. Since the fuel tanks do not seal at room temperature, it is critical that the aircraft links up with a tanker shortly after takeoff. The tankers themselves, the KC-135Q, are modified to handle this fuel. 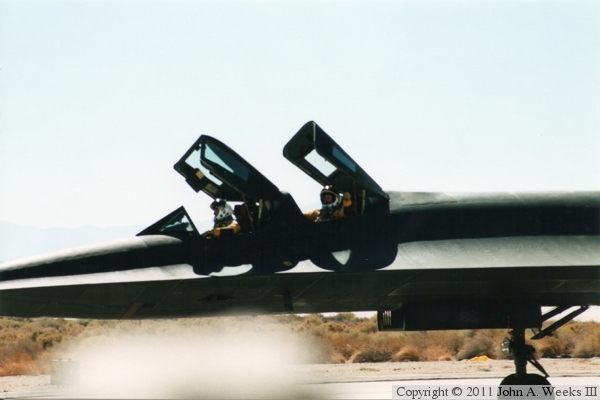 The tankers need to be airborne and in position before the SR-71 can be started up and readied for takeoff. One proposed operations contract, which would have supported about a dozen missions, had a cost of $100-million. That means about $10-million per operational flight. The Blackbird moving under its own power for the final time as it slowly crawls north on the taxiway leading to the ramp at the Main Base complex. The cost of the SR-71 program made it a target in the late 1980s. The USAF wanted to uses the funding for other programs, such as the B-2 Spirit stealth bomber. The Air Force informed Congress that a follow-on program was nearly ready, so the SR-71 could be retired. Final Blackbird missions were flown in late 1989. Some aircraft were sent to museums, but others were maintained in either flyable or long term storage at Air Force Plant 42 in Palmdale, California. The SR-71 has reached the north end of the taxiway at the west end of the Main Base ramp, and is preparing to turn onto the ramp. Three retired SR-71 aircraft were sent to NASA, including the SR-71B dual control trainer version of the Blackbird. NASA used the aircraft for a variety of experiments such as to carry an ultraviolet telescope, to simulate IRIDIUM satellites, to study sonic booms, and to test an aerospike engine. NASA incorporated airshow displays into their training missions, allowing the Blackbirds to fly demonstrations at the Oshkosh Airventure, the Golden Air Tattoo airshow celebrating the 50th anniversary of the USAF, and at open houses at Edwards AFB. The Blackbird crew taxied the SR-71 down the ramp in front of the crowd line for those who turned out to see this historic aircraft flight demonstration. The crew wears a full pressure suit and helmet much like an astronaut. Shortly after the USAF retired the Blackbird, war broke out in the middle east. Cloud cover on the first few days of the war significantly impacted air operations due to lack of reconnaissance. Satellites could not see through the clouds, and the follow-on Aurora spy plane program had failed, so the SR-71 was greatly missed. Members of Congress repeatedly called for, and even voted to approve funds to return the SR-71 to service. The USAF resisted this effort, wishing to use the money for other programs. 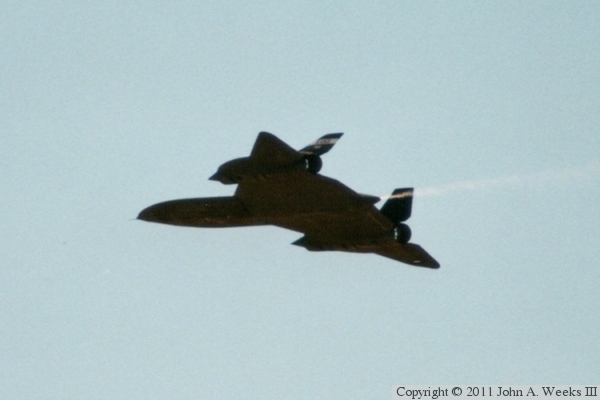 The SR-71 actually returned to the skies for a brief period in the mid-1990s. The USAF grounded the aircraft before any significant number of missions were flown, and the aircraft were retired again in 1998. 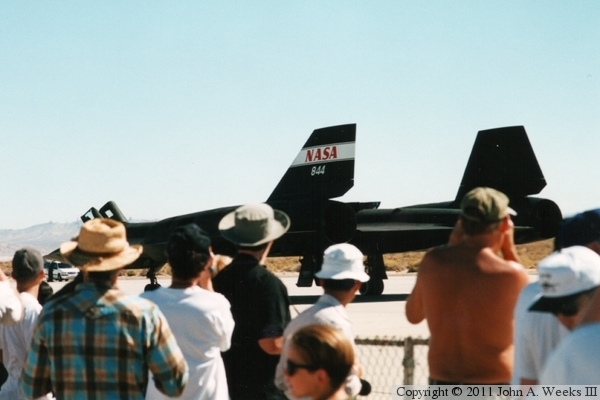 Here is one last view of the SR-71 as the crowd watches the aircraft taxi down the ramp at Edwards AFB. While the Blackbirds no longer fly, they are far from forgotten. The aircraft were transferred to museums starting in the late 1980s. Some aircraft were held in storage, but they have since been released to the USAF Museum. All of the surviving Blackbirds are now on display, although four are located in higher security areas that are difficult or impossible for members of the public to visit. The aircraft that we see above, NASA 944, S/N 61-7980, is now on display at the NASA Dryden Flight Research Center at Edwards AFB. 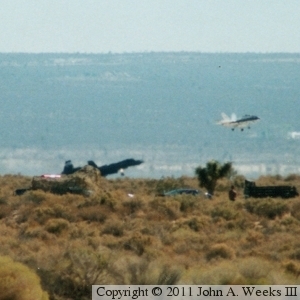 Click here for more information on the SR-71 Blackbird Survivors.